Besides the obvious, there’s a lot of activity that takes place in the bathroom, from hair styling and makeup to taking elaborate baths or handwashing your delicates. 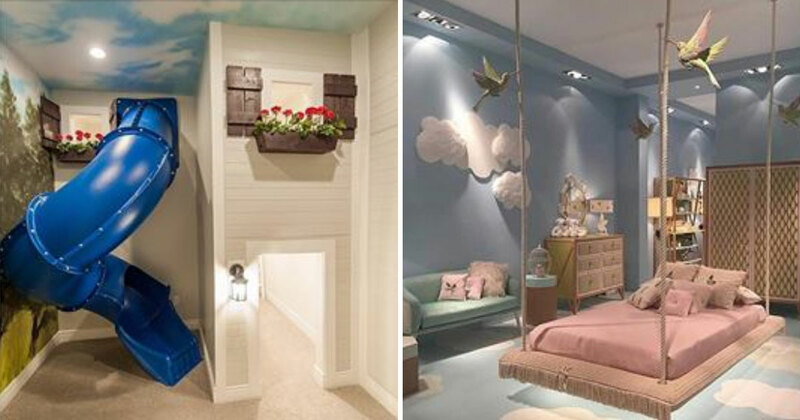 No wonder it’s usually one of the most cluttered rooms in the house! 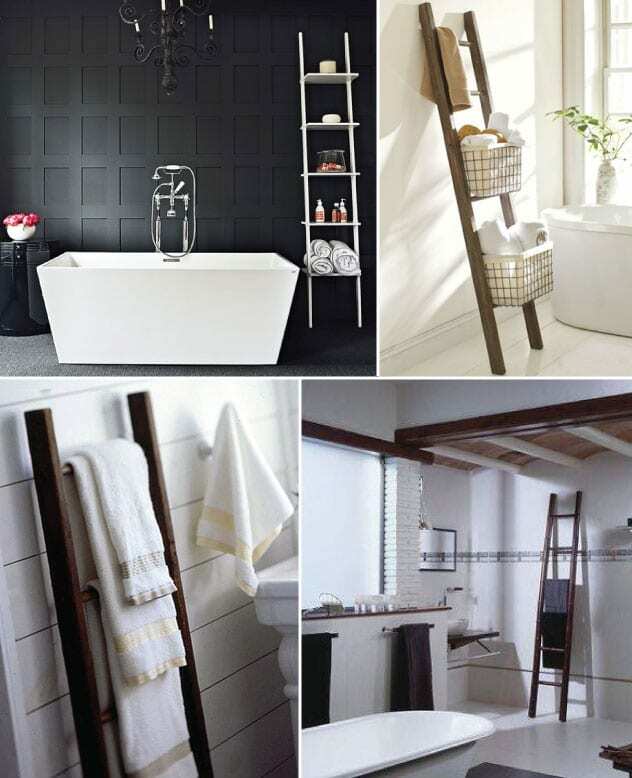 Just because you have a small bathroom, doesn’t mean you have to give up on shelving space. 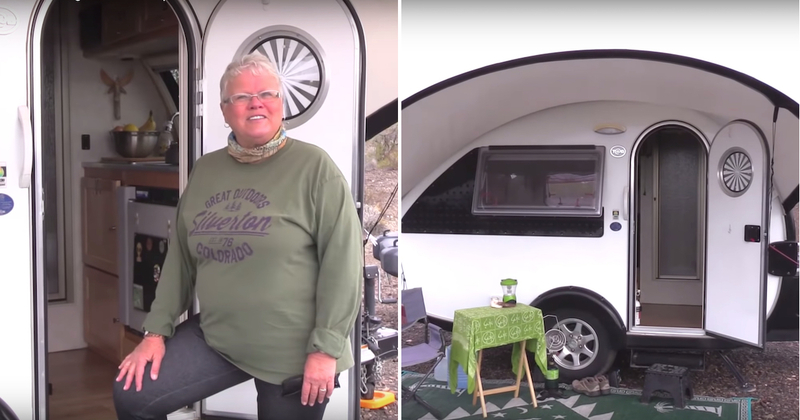 People often forget that they can utilize vertical space as well. The area around our toilets usually goes unused, so why not make use of that space and invest in a surround shelf for your toilet? 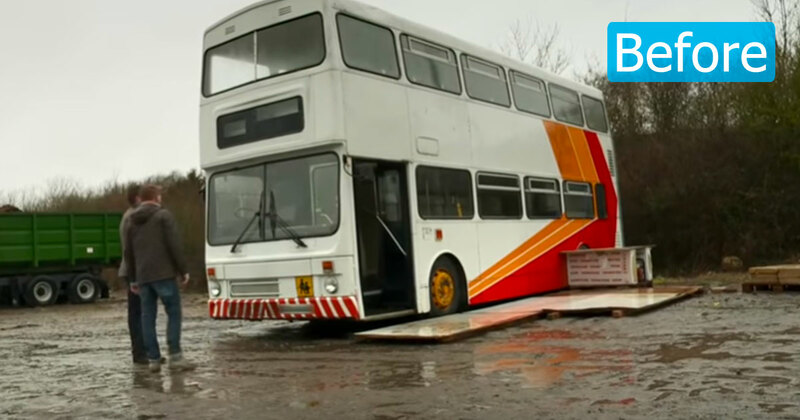 Or, you could build your own! Constantly losing bobby pins? You buy a pack of 100 and somehow, in a couple months, you seem to only have 20, or 2. Where do they go?! Nip this problem in the bud by hanging a small magnetic strip (found in hardware stores) on the wall or shelf in your bathroom. If it’s not something you want to look at, place it on the inside of a cabinet. You can also use it to store nail clippers or tweezers. You can even use a planter box for this one! 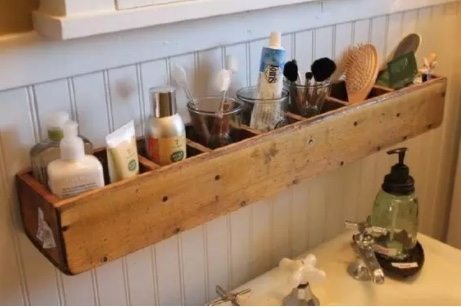 However you do it, hanging a shelf above your bathroom sink frees up tons counter and drawer space. You can also create little dividers or use pretty cups to hold brushes and toothpaste upright, instead of having to dig around in there. 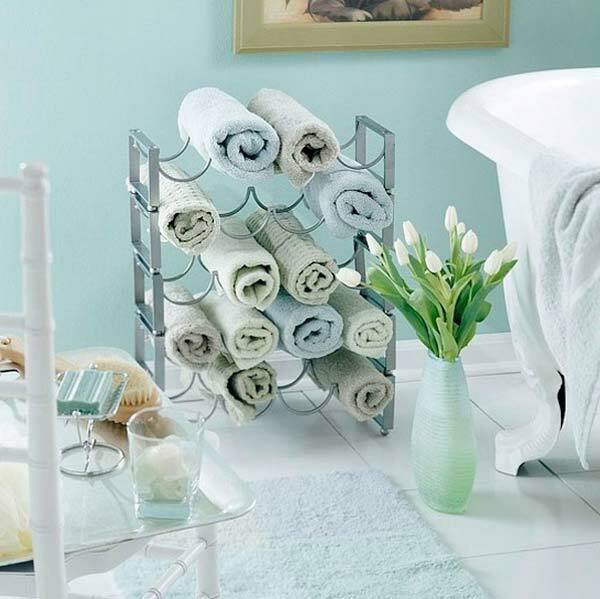 Reorganizing your bathroom is all about finding creative storage solutions. This one utilizes tiny pails hung with some ribbon, twine, or string. These are great for holding brushes, hair tools, or other bathroom products that you need at an arm’s reach. 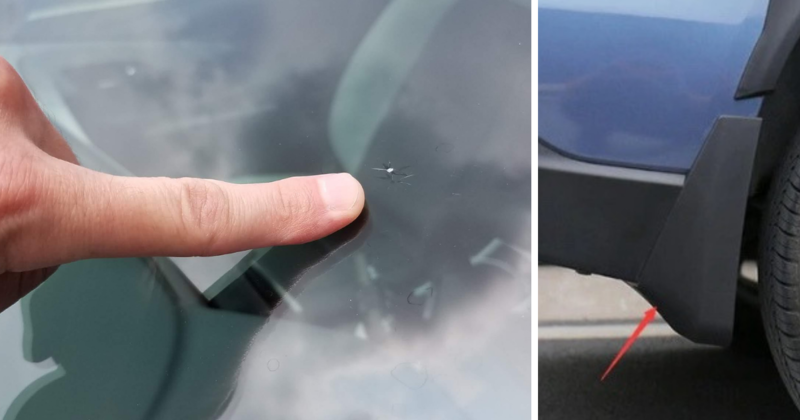 Just make sure to hang it according to how much you’re going to place in it – a suction cup might not work if you have lots to store. You might need a plant hanger that goes into the wall if your products are heavy. Who knew planters were so versatile? 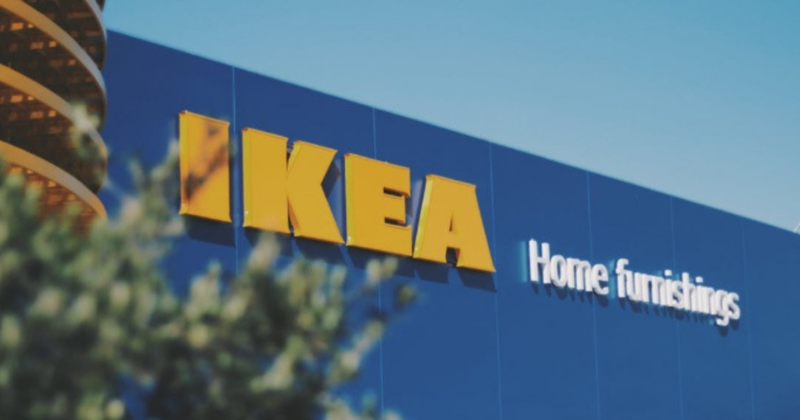 Maybe you should consider shopping in the garden section for your next home project. 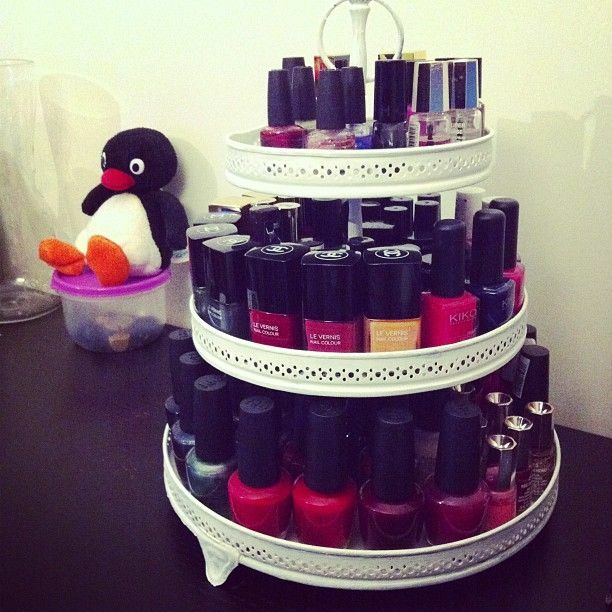 And remember, anything you find can be painted to match your decor! It might not evoke the zen mood you’re going for in your shower, but it truly is a clever bathroom hack. 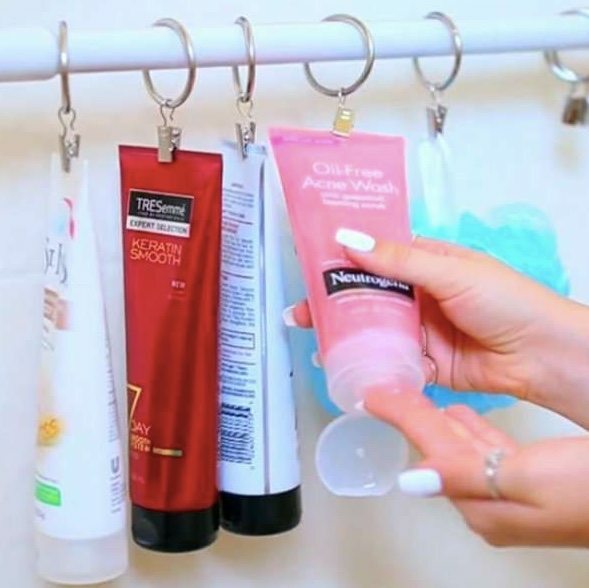 Instead of loading up every corner of your shower with shampoos, conditioners, washcloths, and soaps, find clips at the hardware store and attach them to your shower rod. 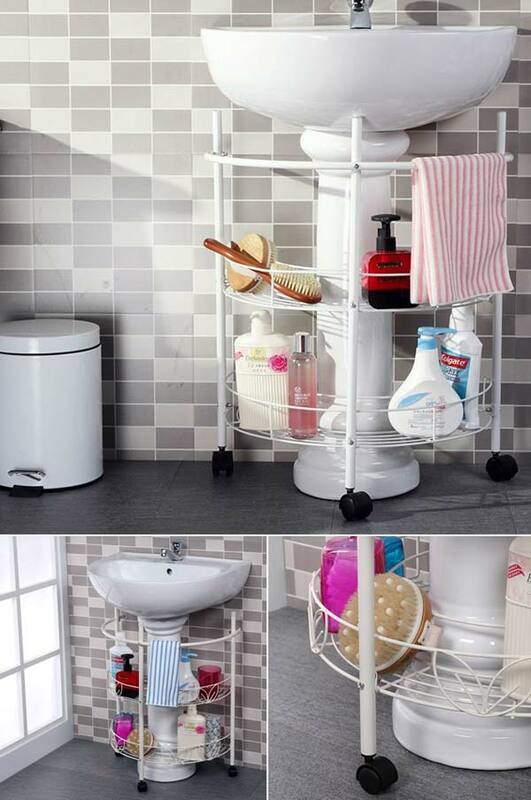 Now you have easy access to your shower products while leaving plenty of space for you! Just make sure you buy clips strong enough to hold the bottles. 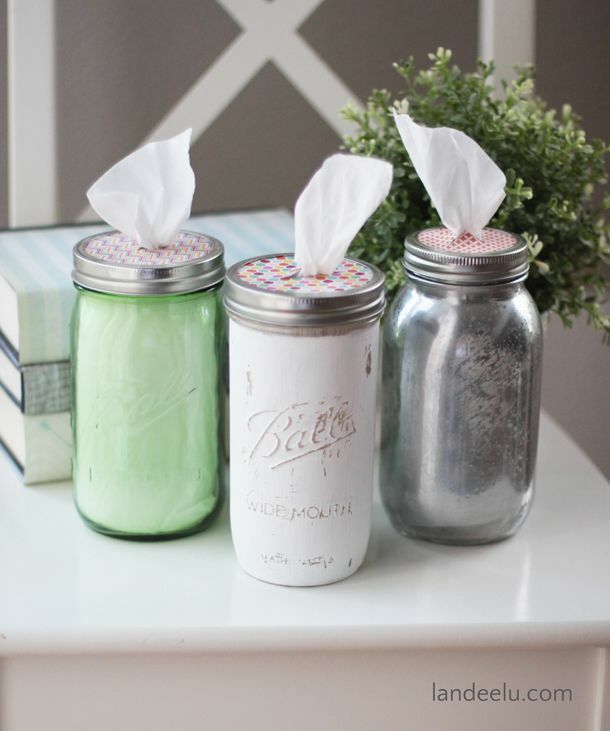 The tissue box in your bathroom might have a cutesy floral pattern on it, but if you really want to get creative, try painting some Mason jars and placing the tissue inside; use colorful or patterned paper to serve as the inner lid – just cut a hole for the tissue to come through! 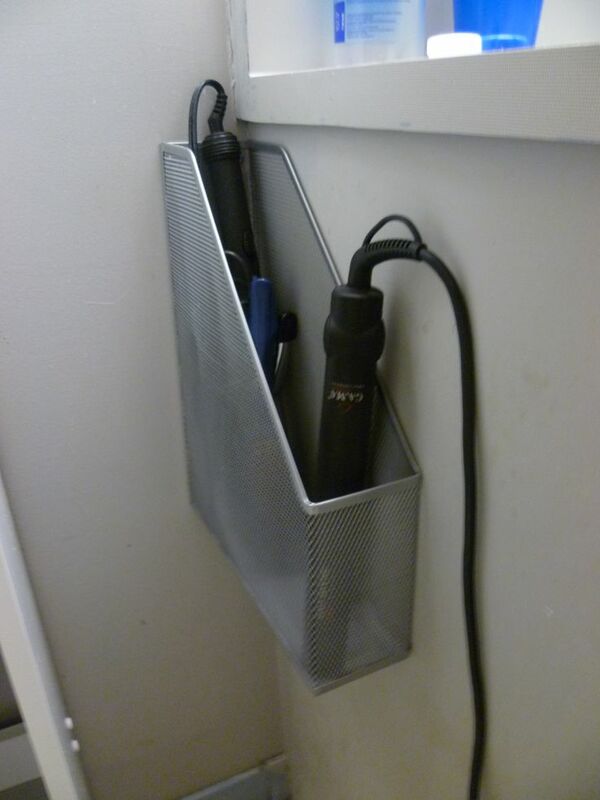 A simple magazine rack can be found for a few dollars at the office supply store and makes a great storage spot for curling irons and hair straighteners. The best part is that you don’t have to wait for the tools to completely cool before placing them inside (so long as you haven’t painted them). Genius! If your bathroom is small and you only have a pedestal sink to work with, you can often find short shelving to slide underneath. 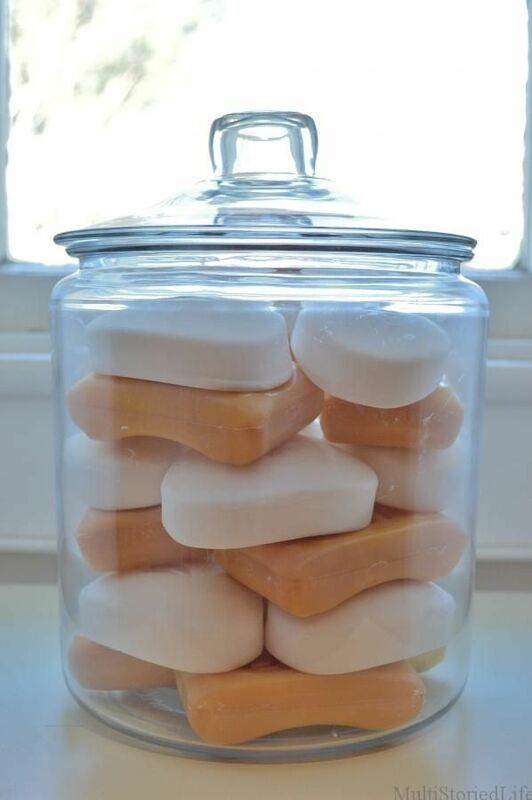 If you’re worried about clutter, use some pretty jars to hold your less decorative products and keep it looking pretty. 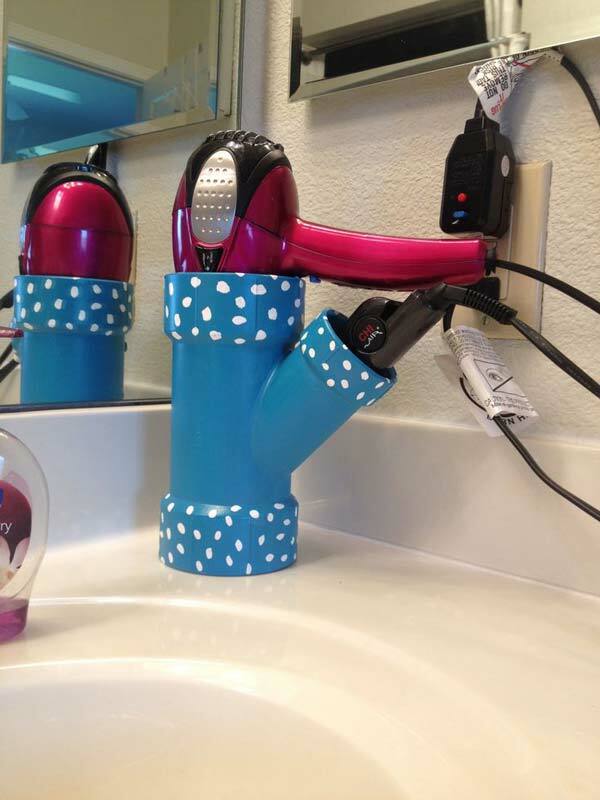 It doesn’t sound like the most aesthetically pleasing solution right off the bat, but PVC pipe can be decorated in way that no one will suspect in order to hold your beauty appliances, even when they’re hot. You can take a look at H-pipes, Y-pipes, or anything that will accomodate an elbow to create your own, based on your needs. Or just take this photo to the hardware store, where someone will be happy to help you. The bathroom is definitely not the place to store your wine (although drinking it in there is another matter), but that doesn’t mean you don’t have use for a wine rack. 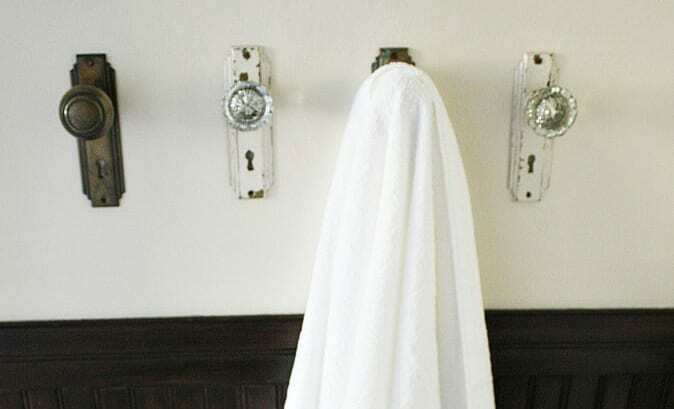 Check out this genius way to store towels! 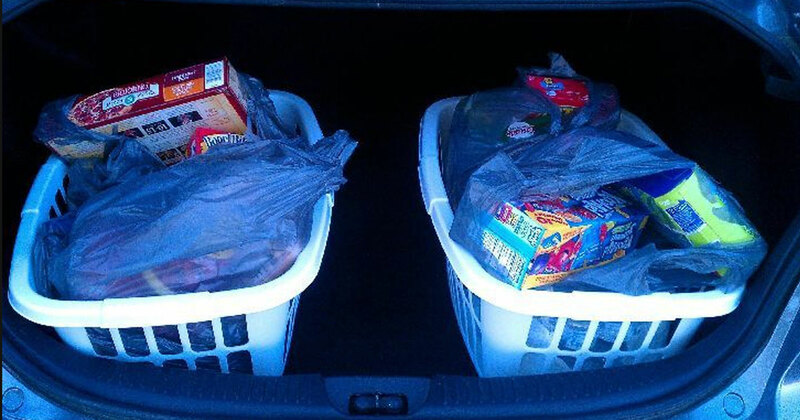 Just roll them up and pop them in – and store larger towels on the top. You don’t need to build a deep storage case for most bathroom items. Beauty products like nail polish, hair sprays, and medicines only need a couple inches of depth. 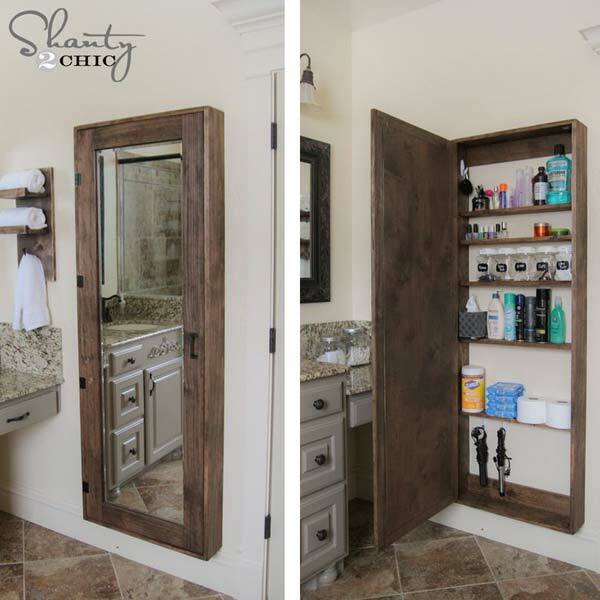 Build a larger version of a medicine cabinet that also acts as a full-length mirror in your bathroom to get the clutter out of your way. The tutorial for this one can be found here. 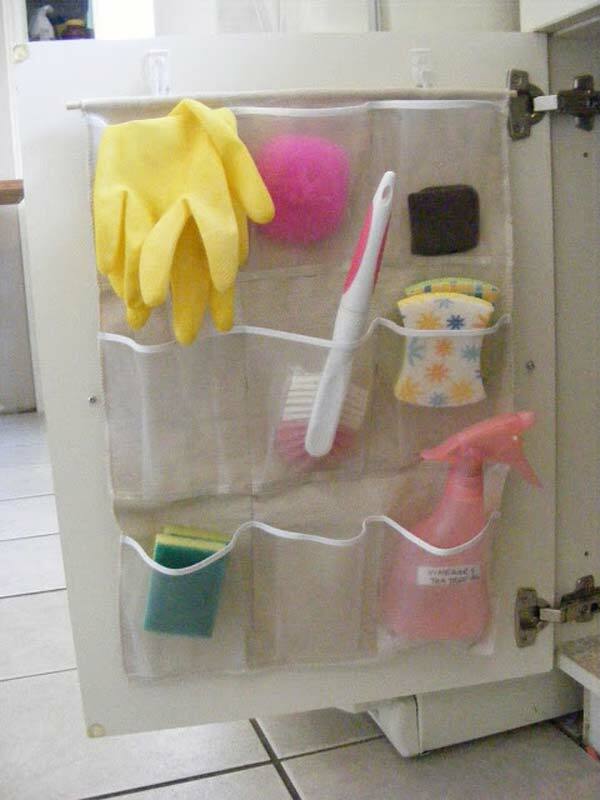 Some pocket storage underneath the sink is the perfect way to store sponges, gloves, and cleaning products you need in the bathroom but don’t need to look at all the time. If you don’t want to run out and buy one, you can even make your own, using these instructions. 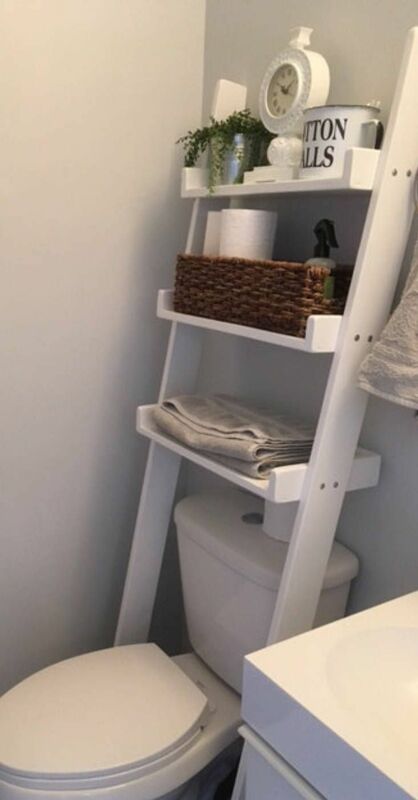 Ladders are a great way to provide some vertical storage if you have a bit of extra floor space and some towels or pretty products that you’d like to show off. Not everything needs to be hidden away in your bathroom! 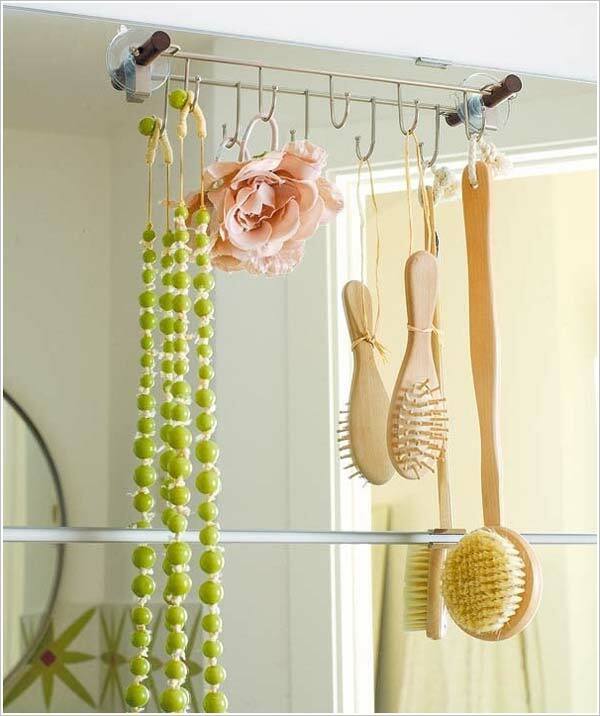 Do you have some pretty necklaces or other accessories that could glam up your bathroom if they were on display? If you have a nice, big mirror, try attaching suction cups to a hook bar and letting items dangle (as long as you can still see in the mirror). This keeps them from getting tangled too, or just ending up in piles or bowls on your counter. A half table is a perfect way to add another shelf to your bathroom without taking up too much real estate. 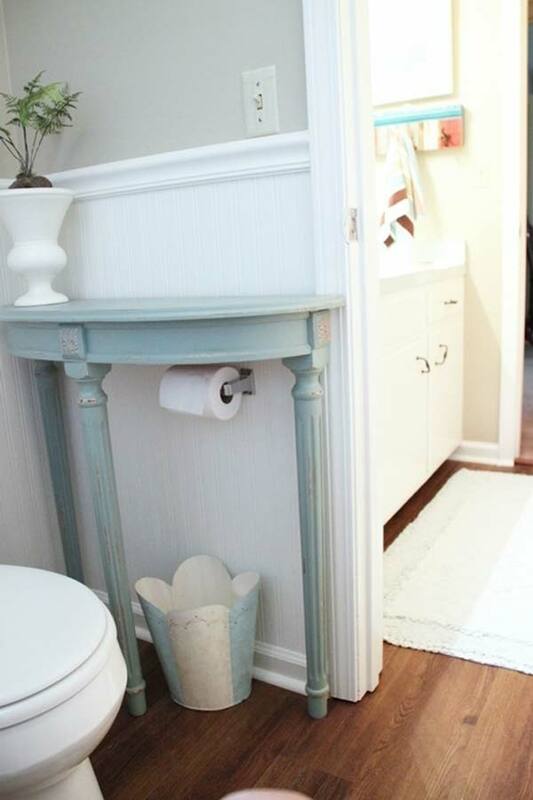 We love this idea of storing the toilet paper and trash can underneath and using the table itself for a nice plant or candle. 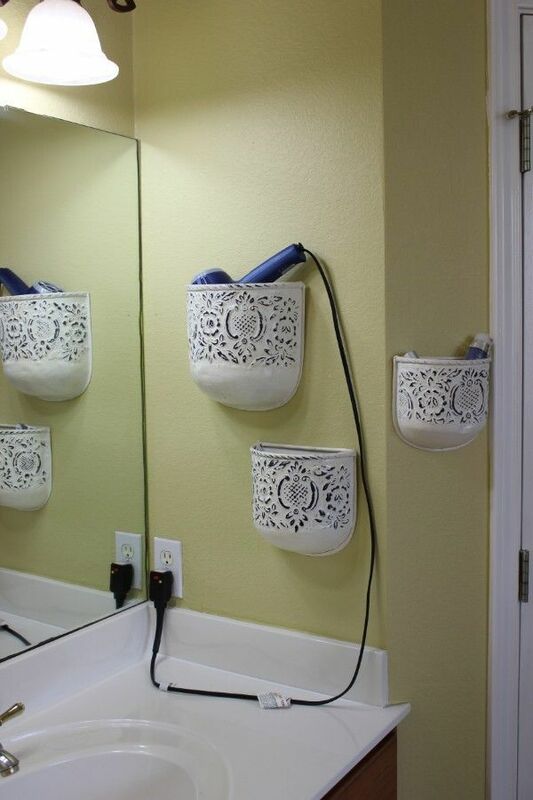 We just can’t get enough of these garden hacks for the bathroom. 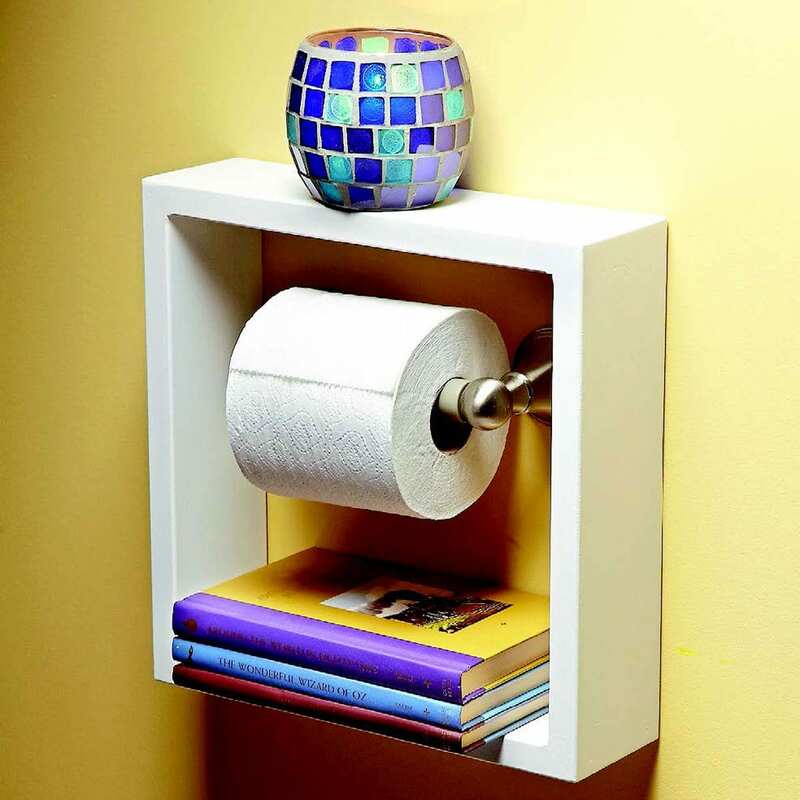 This time, a plant stand doubles as a toilet paper, towel, and washcloth holder. 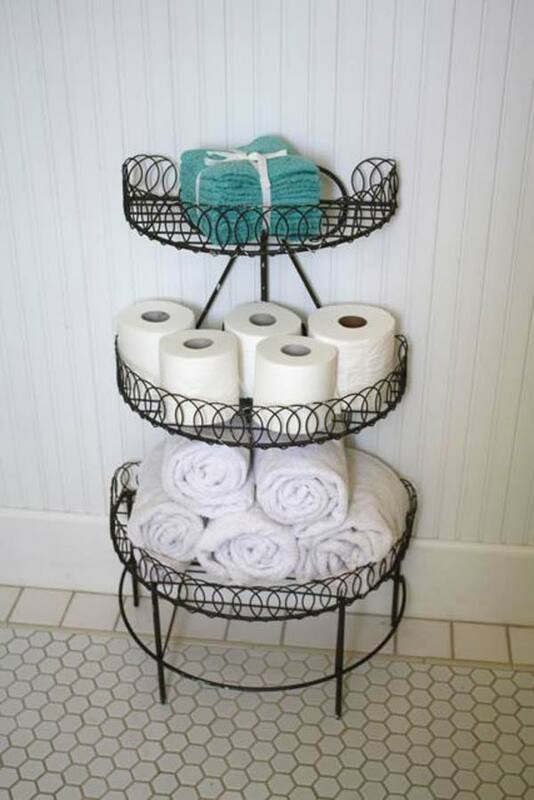 If you’re really pressed for storage space, you can even build a little shelf around your toilet paper hanger. While it might not strike you as the most sanitary option, a quick wipe down of whatever you store there will keep it neat and tidy (and free from little paper particles piling up on your items). A candle is a good option for the top – and you can store some pretty matches underneath. Not everyone likes to read in the bathroom, but if you do, you know that it’s less than ideal to stack your material on the floor. 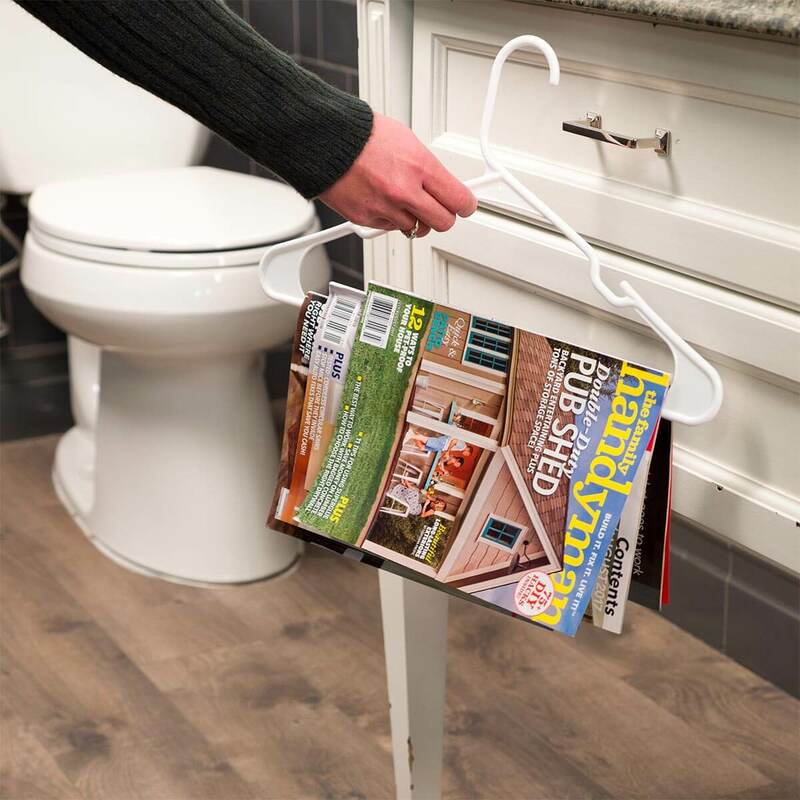 If you don’t have floor space for a proper magazine rack, you can use a simple hanger. A more decorative version can be hung right on the wall for storage that lays nearly flat. 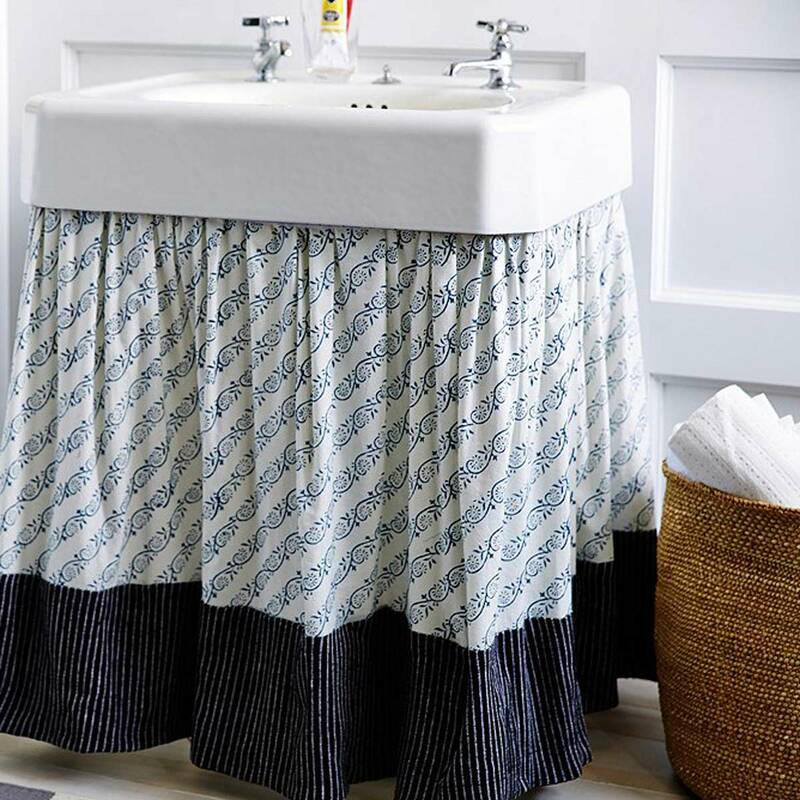 If you have a pedestal sink and need to store supplies underneath, you can create an easy sink skirt. This prevents you from having to see the clutter. Plants relax us, and no matter how small your bathroom is, it’s nice to get a sense of peace when you’re taking a few minutes to yourself. 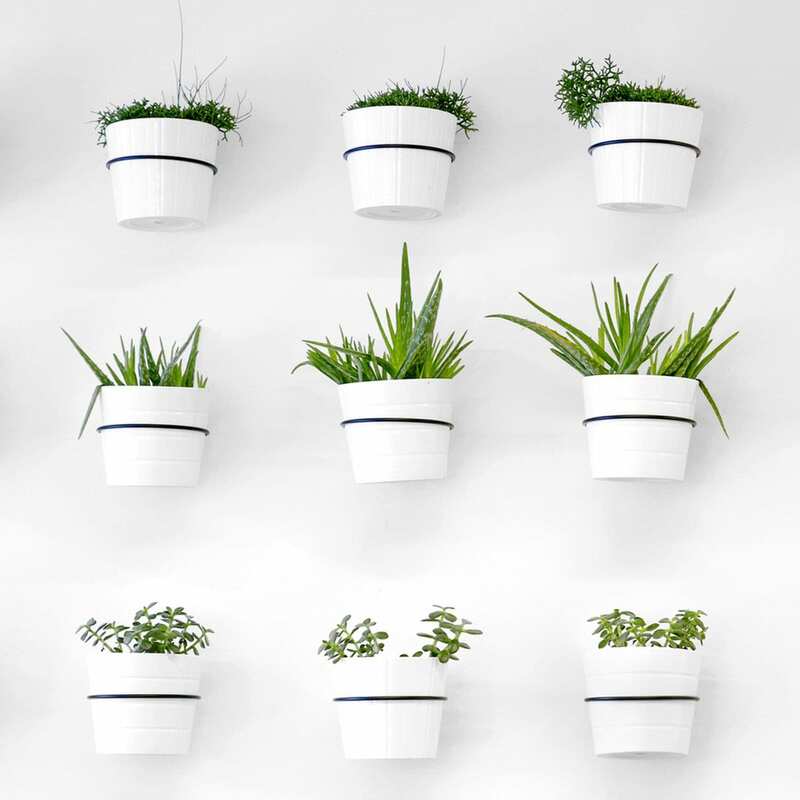 If you don’t have room for a floor or shelf plant, tiny pots with real or fake greenery can be hung on the wall to liven things up or create a more meditative feel. Ok, we’ll admit that you have to be pretty crafty to pull this one off, but if you have a handyman around the house, you might look into this clever storage hack for your bathtub. Imagine not having to find space in every corner of your tub for your shampoos and soaps! Not only will your towels dry faster, but no one has to argue over the proper way to fold and hang a towel for a nice neat bathroom. 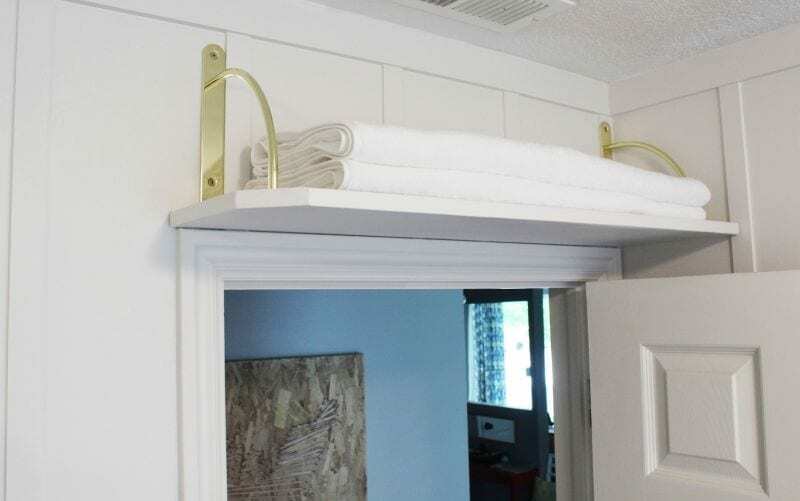 Simply repurpose a nice coat rack and not only can you hang more towels than a regular rod would hold, but you might get some extra shelving on top! 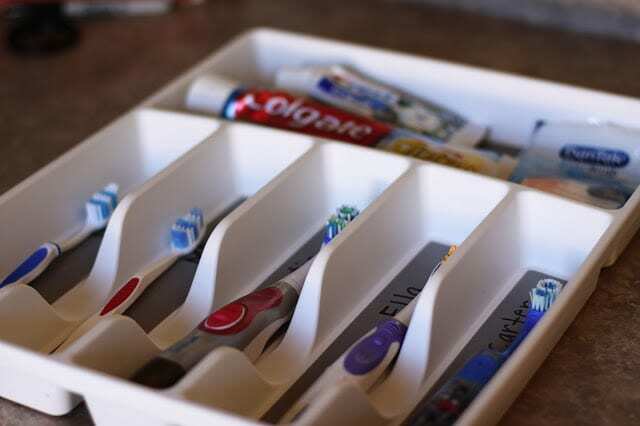 Not just for separating your forks and spoons, a cutlery organizer can be just as useful in the bathroom, especially if your electric toothbrushes and other fancy gear takes up a lot of countertop real estate. If your bathroom has some space behind the door, that can be a great place hang floating shelves. These ones are made with crown molding for a more decorative touch. Just be sure you have a door stopper to keep from slamming the door open on to your shelves! 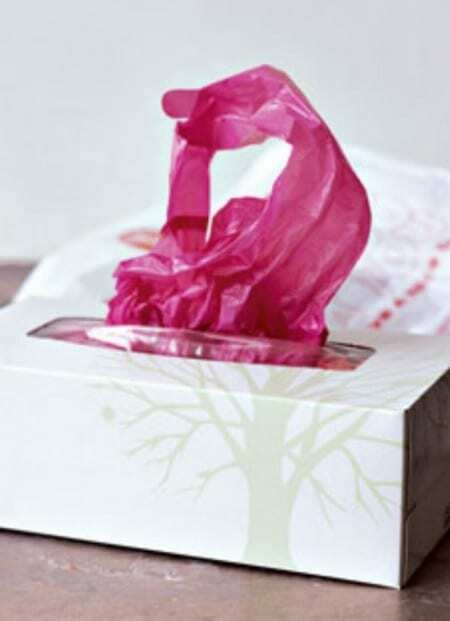 A plastic bag never made anything look less cluttered. 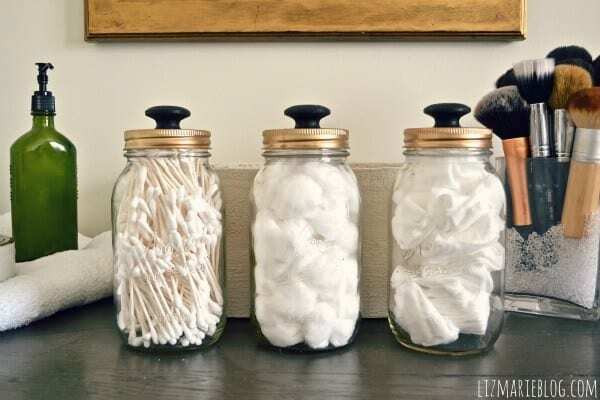 Instead of keeping items in their original packaging and rummaging through the cabinet every time you need a cotton ball or Q-tip, store them in glass jars. Don’t have the drawer space to store all of your beauty products? 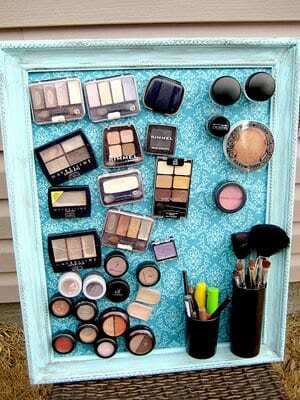 Create a magnetic board to show off your palettes and your design skills. Just attach a tiny magnet to the back of your products and admire your collection whenever you want. It also keeps you from rifling through drawers and bags, running the risk of cracking your blushes and eyeshadows. 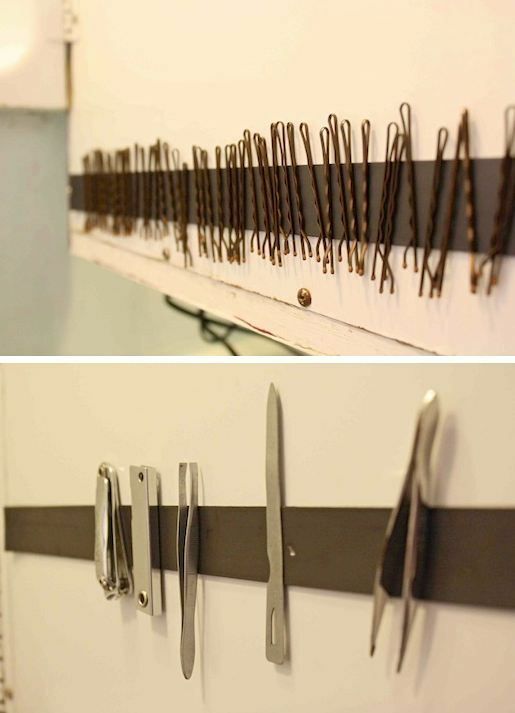 There are all sorts of creative ways to hang things on the wall space in your bathroom. We love this new use for old doorknobs – it’s unique and can look shabby chic or just plain glam, depending on what you choose or how you paint them. Instead of trying to smash all of your recycled plastic bags into a cupboard, try storing them in an empty tissue box instead. That’ll keep them nice and compact, and you can even stack boxes to keep things neat. 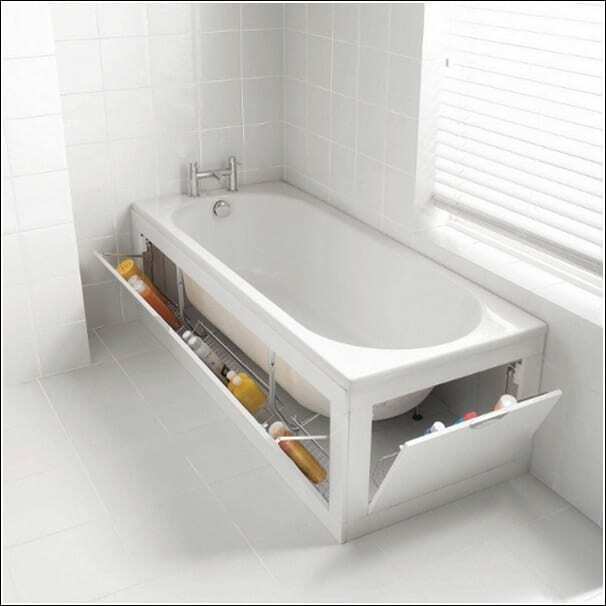 If you have items you don’t need often, try using the space above your bathroom door for more shelving. 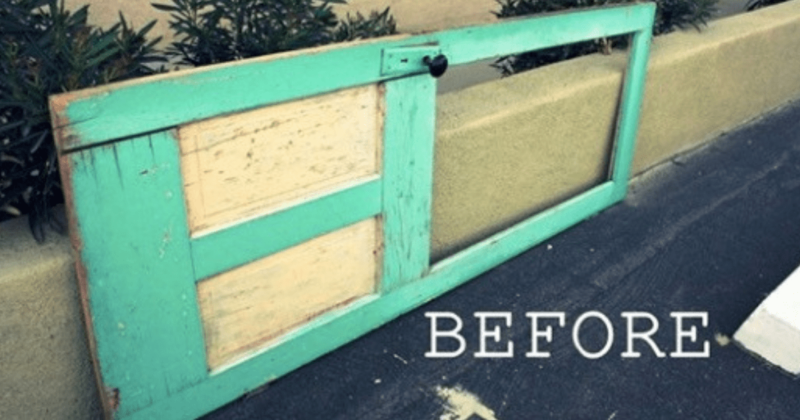 Instructions for this space-saving hack can be found here. Shower rods can be found pretty cheap. 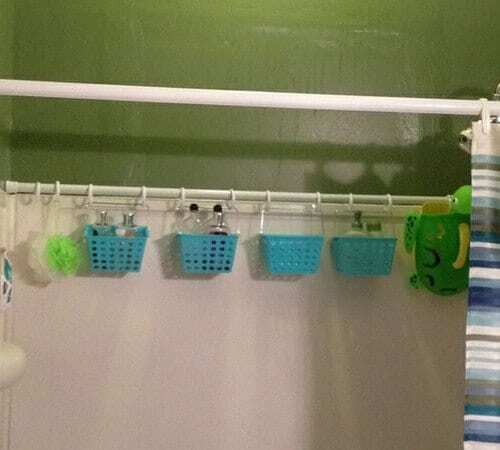 Try hanging one inside your shower on the opposite side in order to hang extra items. That way you won’t have to rearrange things every time you slide your curtains open and closed. 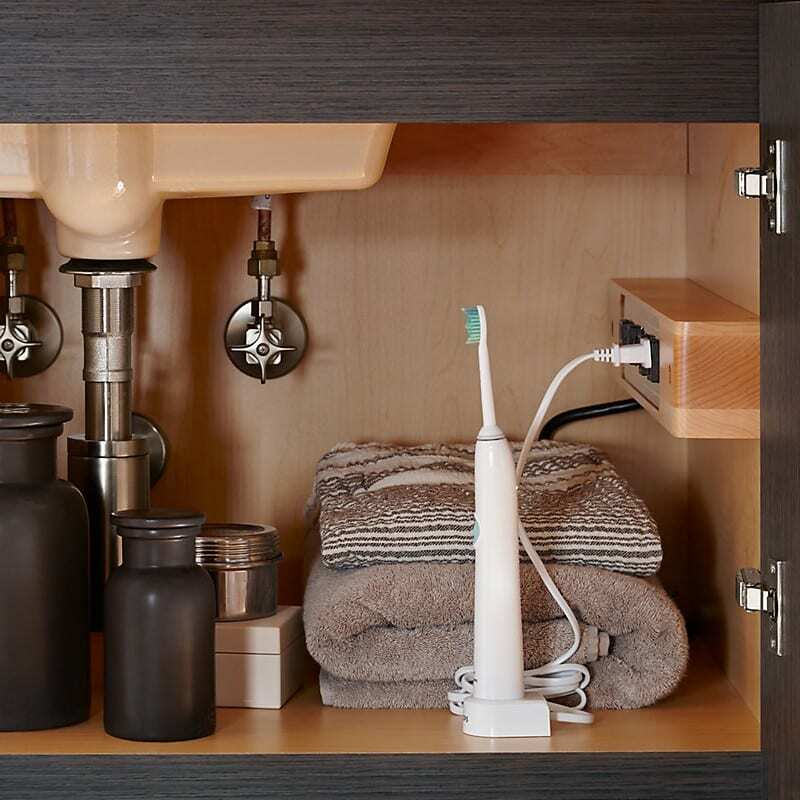 You might need the advice of an electrician and/or a plumber to make sure you’re not creating a fire hazard, but creating a space to plug in your chargeable bathroom devices that keeps them out of your way can save tons of counter and floor space. Anyone with electric toothbrushes, water flossers, epilators, electric cleansing brushes, etc. will appreciate having their cords out of sight. Let’s face it, there’s a lot of stuff in your bathroom cabinets and drawers that you thought you’d use, but didn’t – at least not before it expired. Don’t keep around old stuff just because you feel guilty. 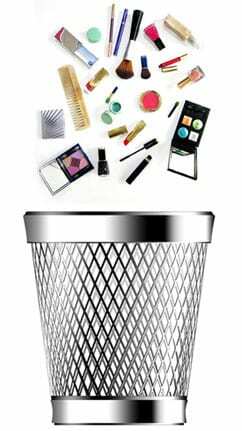 It might feel wasteful to throw products in the trash, but if they’re long-expired or impossible to donate or give away, be honest about whether or not they need to be taking up space in your life. 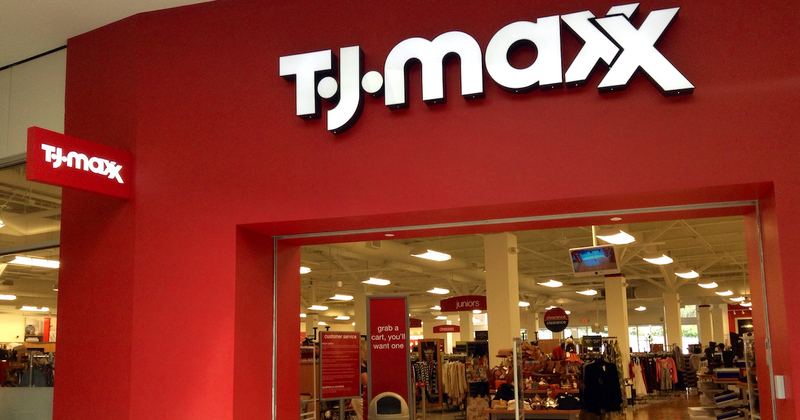 Click here to see just how long some of these products last. No one gets excited about cleaning or organizing the bathroom, but if you incorporate some of these tips one by one, pretty soon you’ll have a nice, zen space where you can have a moment alone, prep for your day, or get ready for a relaxing night.